Howard "Hold me George... I'm frightened!" Bush "It's okay. Everything will be all right Jeff, err, Jed... what's your name again?" This photo appeared on the front page of today's Herald-Sun, and when I saw it, I couldnt stop giggling. 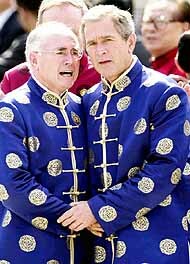 It shows our illustrious Prime Minister, John Howard, enjoying a bit of a snuggle with "world leader" George Dubya.